TechnoTan offers a broad selection of Spray Tan Compressors, from the compact Mini Mist Compressor to the premium ProMist Plus. Spray Tan is applied using a High Volume Low Pressure “HVLP” applicator. The “high volume” function is provided by the compressor, which supplies the air; while the spray gun utilises a “low pressure” function. This results in a higher proportion of tanning solution reaching the body whilst ensuring there is minimal overspray. Is developed by spray tanning professionals for spray tanning professionals. The ProMist Plus has an easily cleanable and replaceable filter, a convenient connect and release hose fitting and a nozzle that allows the tanning technician to adjust the spray pattern. Built with premium components, the variable speed, lightweight 550 Watt compressor motor has a relatively low noise output. Customise the colour of your compressor to suit your salon’s aesthetic with a choice of Black & Silver, Black & Gold or Silken Chocolate (Bronze). The ProMist Plus Compressor is compatible with the Advantage, ProMist and Premier series of spray tan application guns. The ProMist Cube is a powerful compressor for professional spray tanning technicians looking for a reliable machine without the premium features of the ProMist Plus. It features a 550 Watt compressor motor with 3 selectable speed settings, and despite being slightly heavier than the ProMist Plus, it is still a very portable, light spray tanning compressor. 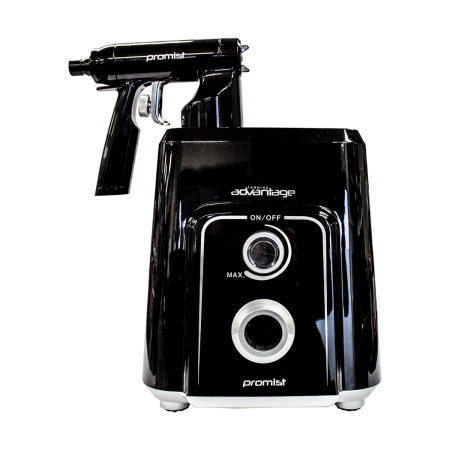 The ProMist Cube Compressor is compatible with the Advantage, ProMist and Premier series of spray tan application guns. Despite it’s small and light form factor, the Mini Mist compressor is still a very capable compressor. Designed to be compact and portable, it even features a convenient carry strap perfect for mobile tanning. At 400 Watt, the Mini Mist compressor is our lightest compressor, but it still has enough grunt to provide an even application of spray tanning solution to tanners on the go. THE ULTIMATE COMPLETE HANDHELD UNIT! 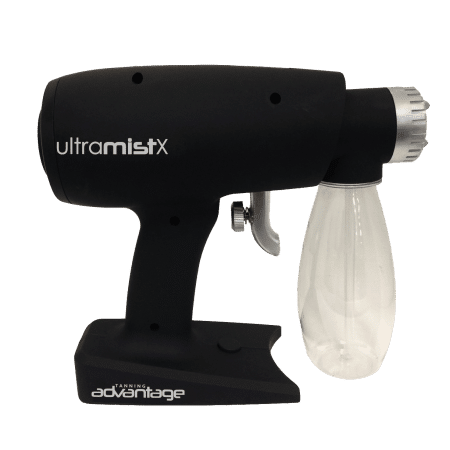 The UltraMistX is compact, convenient and ideal for the Mobile Tanner. It’s beautiful and wide and is easily adjustable to give the perfect tan application. No compressor or hose needed!